I'm afraid of my washer and dryer. I recently asked Jon if he heard about the cobra that was found in a Houston apartment complex this past summer because someone owned it AS A PET (like, why. WHY?!) and it escaped. And Jon told me about a woman finding one (a neighbor's "pet" as well) in her home in Florida. He said "do you know where they found it?" and I was like, "umm, in the piping in the ceiling or something?" And Jon goes, "Nope, that's not where. Do you want to know?" You know those moments in life when your brain is telling you very loudly, "No! You don't want to know! Stay ignorant on this one, it's for your own good! TELL HIM NOT TO TELL YOU!" That's exactly what my brain did. So of course I said, "TELL ME." Needless to say all weekend long I was avoiding laundry like the plague, asking Jon to retrieve clothes for me, and cautioning him to "watch out for cobras" as he did. During rare moments when I'd let my guard down and walk casually by the dryer, Jon would say, "LOOK OUT FOR THE COBRA!" and I'd jump high in the air. My boyfriend is so funny sometimes. Fortunately the cobra did not get us, and we lived to have dinner at the new Southern Goods with my dad! 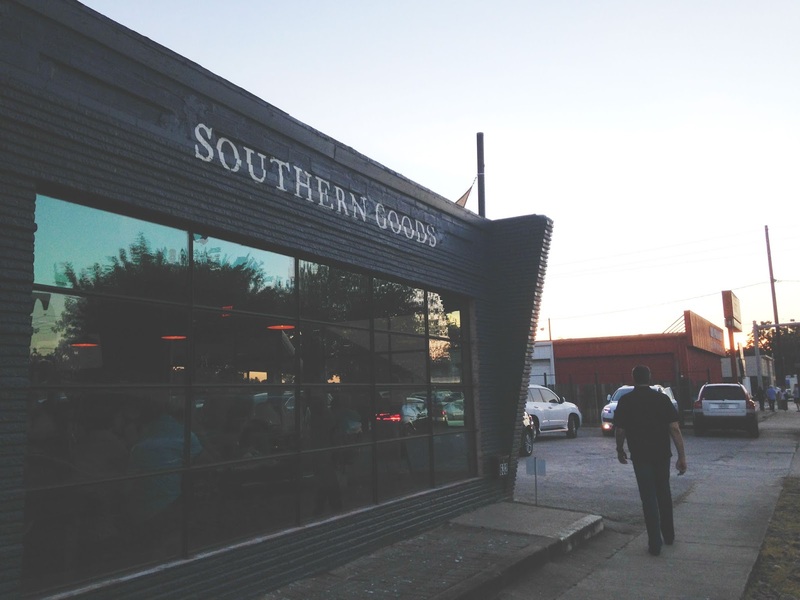 I had been to Southern Goods once before, but it was during White Linen Night in the Heights, and we all know what a hazy crazy evening that is! So it was necessary that I came back again for a clearer and calmer time. The wait for a table for three at 7:00 pm on a Saturday was 30 minutes, which I didn't think was bad at all, especially given the recent popularity of Southern Goods. 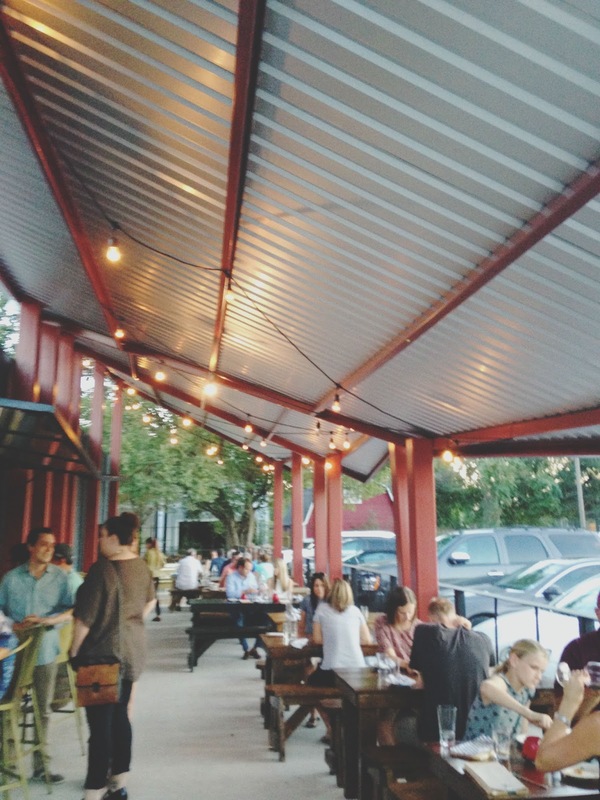 The inside of the restaurant is rustic and dim, and the outside patio is airy and dreamily lit with string lights. Once seated inside, we took a look at the menu, which is pretty small, but filled with creative, delicious-sounding plates. The menu items are organized by size, having the smaller plates listed on top, and increasing in size the further down you go. This setup reminded me of the menu at Cured in San Antonio. There weren't any larger portioned vegetarian items, so I decided to order a lot of smaller plates, starting with the skillet cornbread, which we all shared. This cornbread was unbelievable. It was wonderfully sweet and grainy, and the fresh chives garnished on top provided it with a playful, crunchy contrast. Crispy around the edges, the inside still managed to be incredibly moist. 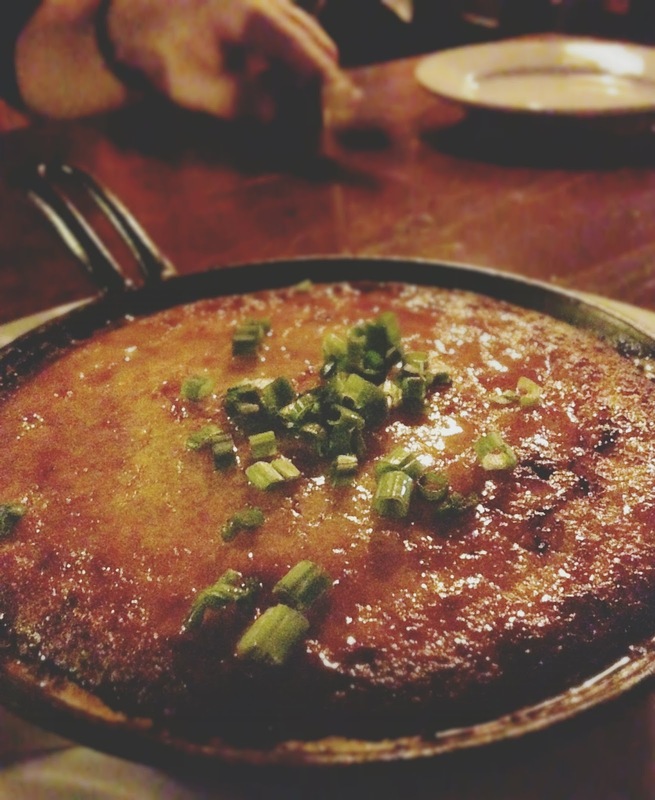 The way the cornbread was prepared in the skillet produced a sort of caramelization on the outside, which was absolutely lovely. My dad dubbed this "the greatest cornbread he's ever had," and I can't say I disagree! Next up was the Mexican street corn. 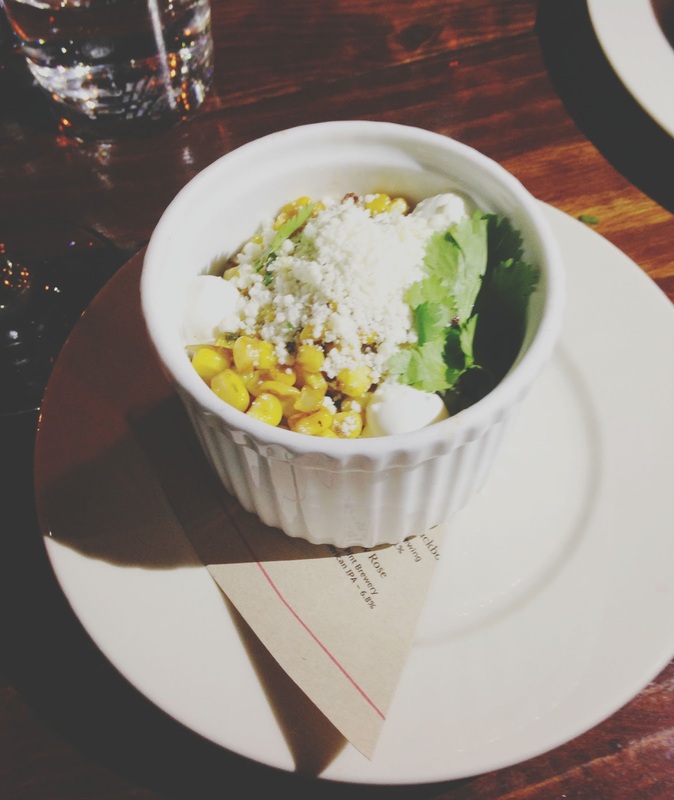 Topped with cotija cheese and cilantro, this was your standard [delicious] Mexican street corn. The corn was wonderfully fresh and sweet, and the melted cotija offered a nice creaminess once stirred in. This was not a brand new Mexican street corn dish, but it was a reliable one, and certainly one that I would order again. After that, I tried the fried green tomatoes. 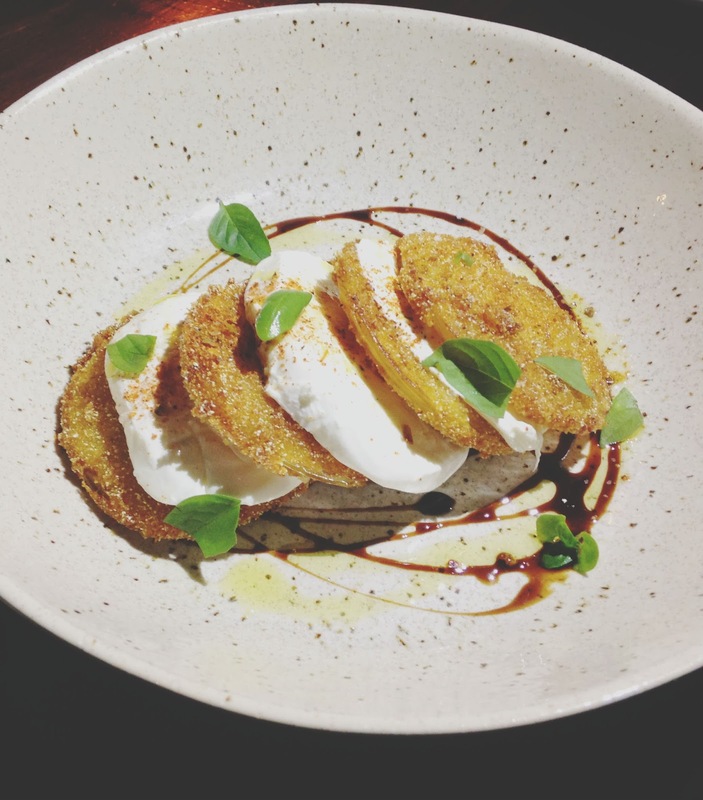 This essentially was a caprese salad, using fried green tomatoes in place of your normal raw, red tomatoes. How interesting is that?! And it was a lovely little dish. The lightly battered tomatoes were layered with hand pulled mozzarella, aged cane vinegar, Texas olive oil, fragrant basil, and other fresh herbs. There was a nice softness to this palate-cleansing dish, and it probably would have best been served as my opening plate. The syrupy vinegar gave it a slight naughtiness, but I would have preferred more of it. Overall though, it was a unique, light, and pleasant dish. Last up for me were the fried mushrooms. WHOA. These were neck and neck with the cornbread for my favorite dish of the evening, but I think these came out on top! 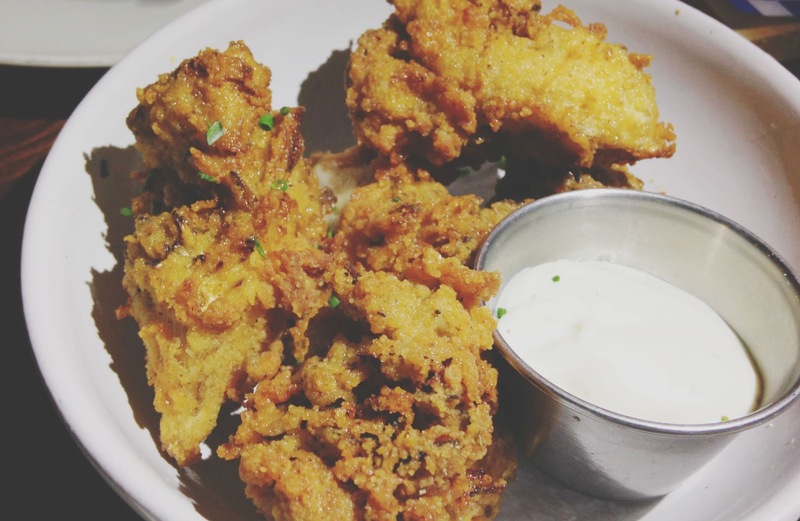 Hearty, textured, hen of the woods mushrooms were fried and served with a side of dill buttermilk dressing. The mushrooms were golden, crispy, and earthy, and the dressing was creamy, rich, and tart. Paired together, the two were absolutely outstanding. I could not get enough of these! 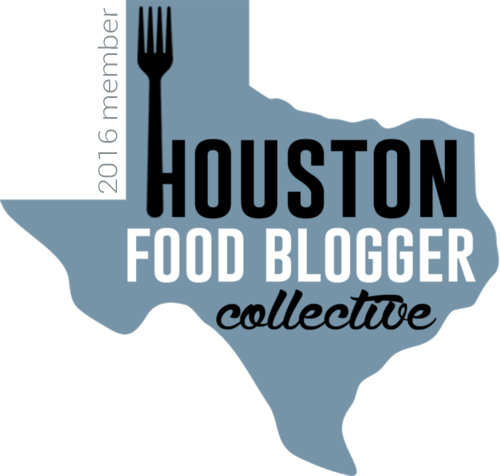 After my dinner at Southern Goods last weekend, I see what all the fuss is about. 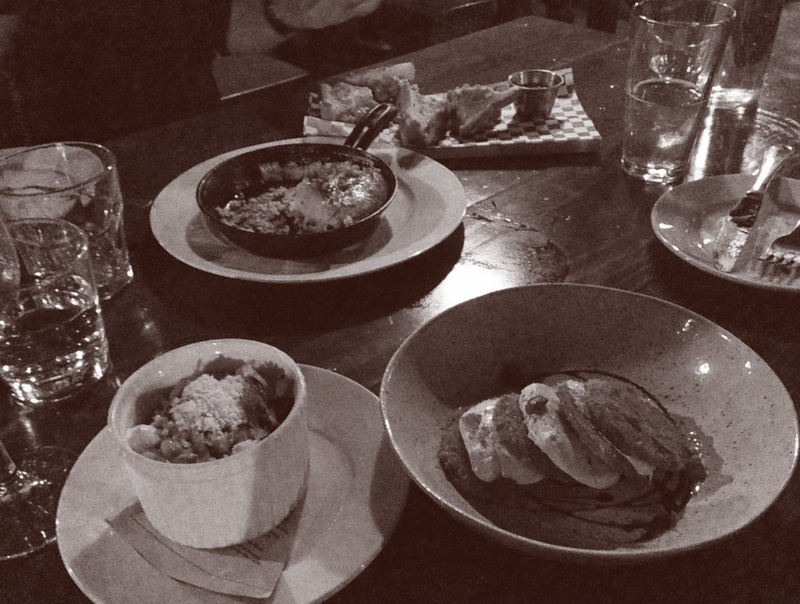 We had a great time, and it was exciting to try several very different, very carefully-crafted dishes. 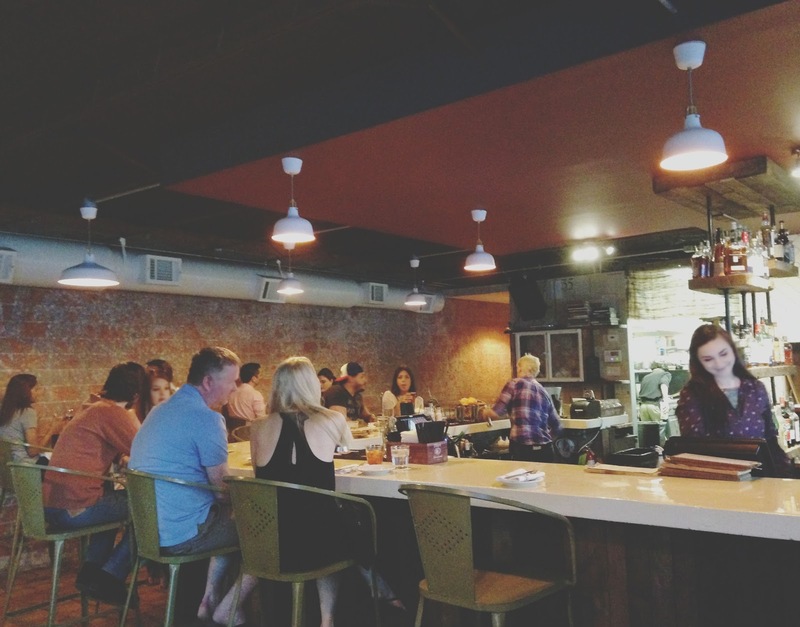 I definitely recommend this non-pretentious, cozy, neighborhood joint which offers thoughtfully prepared southern-inspired fare and excellent service! I'm seriously considering going here for my birthday dinner. I always stress myself out trying to pick something that's special and out of the ordinary but somewhere cozy and neighborhood-y sounds like more my speed. I went for the soft opening and loved the burger so I'm excited to try something else! I think it'd be a great choice! They have a lot of open seating outside on the patio and out back, so if the weather is nice, you'd have way more options in terms of space.